Homemade pizza. Mmmmmm. So good. And inexpensive. In a large bowl (I use my kitchenaid mixer), combine 1 c. flour, sugar, salt, and yeast; blend well. Gradually add warm water and oil to flour mixture. Blend at low speed until moistened; beat 2 minutes at medium speed, scraping bowl occasionally. By hand, stir in additional 1 to 1 1/2 c. flour, until dough pulls away cleanly from the sides of the bowl. On a floured surface, knead in 1/4 to 1/2 c flour until dough is smooth and elastic, about 8 - 10 minutes. Cover loosely with plastic wrap. Let rest in warm place for about 10 minutes. Heat oven to 450. 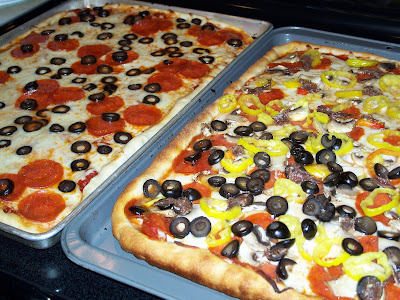 Grease an 11x15 cookie sheet, or a 12 pizza pan. Place dough on sheet and work from the center outward, until the crust covers the surface. Pinch edge of dough to create a rim. Prick dough randomly with a fork. Pre-bake crust at 450 for 5 minutes. Remove crust from the oven, placing on a wire cooling rack. Cover dough lightly with sauce of your choice, followed by cheese and other toppings. Place back in oven, and bake an additional 10 minutes, or until the crust is golden brown, and the toppings are thoroughly heated. Serve immediately.